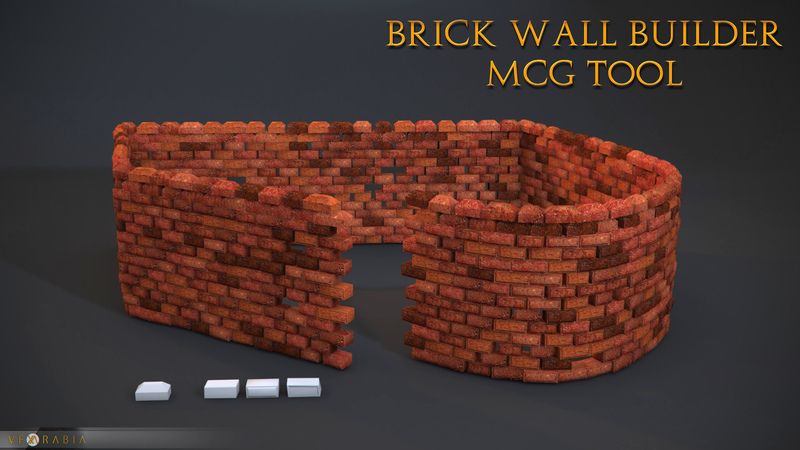 Brick Wall Builder is a scripted plugin created using 3ds max MCG and as the name tells it creates a various shapes of brick walls with huge amount of flexibility like you can choose multiple kinds of stones and apply a random materials to them in addition to changing the position,rotation and scale uniformly or randomly. It's as simple as just picking the shape and the brick and it will do the rest, and when you are done with distribution you like and thought of changing the shape length do worry also has the ability of maintaining the count and distribution while you are doing so. How to install: After downloading and unzipping the file go to Scripting menu and choose Install Max Creation Graph. after installing you will find it in command panel creation tab under VFXarabia category. -I fixed the straight lines issue (in case your shape was a rectangle with straight angles for example). -The parameters now in system unit. -Increased the limits of some spinners. -Fixed the min and max, so when you put one for min you will get one. -Be careful if there is no objects in the end part list please do disable the end part check button or else the tool wont update. -Random scale remapped and goes from 0 to 100 properly now. -Adjusting the path vertexes on Z axis will mess up the bricks orientation in a weird way, now it's fixed and however you modify it it will stay pointing up. -The bricks are one unit shifted on z axis when created, it's fixed now. -Now the tool will preserve your bricks Material IDs and will not overwrite them to (1). -I removed the proxy feature, it doesn't work as it's suppose to work. Instead you can apply BBox modifier to your brick. -Since last update Side Shift uses the wrong direction, it's fixed now. Submitted by Alaa alnahlawi on Sun, 2016-01-31 06:37. I think in ex2 they Curve index, so I think you need to use this modified one. and there is a problem in ext2 the random is not working properly, I reported this problem to autodesk. Submitted by joelauduo on Tue, 2016-01-26 03:47. I like it very mush!its very cool mcg!! Submitted by vusta on Sun, 2015-09-06 03:54. Submitted by rhed on Sun, 2015-09-06 03:00.
please what shall i do. Submitted by vusta on Wed, 2015-08-26 21:58.
yes the Custom UI will override the value you put in the parameter...but as good habit, I make sure I change both to the same value, anyway I've changed both to max 99999. Then I dialled in value 55555, save, exit, reopen max file...and value stays. Submitted by Alaa alnahlawi on Wed, 2015-08-26 19:49. Claus, I'm trying to make the tool stack rocks what ever the size is. and for the unit part I will check it out, it should be easy to fix. Vu, hey man I already did that but every time max starts and evaluate the tool it overwrite that part of parameters, so when I use the tool you will find an empty rollouts, and all of them are stacked in the first one. Submitted by vusta on Wed, 2015-08-26 16:02. Submitted by claus73 on Wed, 2015-08-26 13:54. Second - My system units is set to mm. and the vertical gap and probably other parameters doesn't go higher than 10 cm's which is problematic for my 12 cm brick. I've tried to change the max value in the the creation graph my self, but it does not seem to effect the tool in the scene. It would be great if I could choose half a brick to be placed every second stone at the end of a wall to make a flush end/opening.